In 1823 W. H. Keating, the geologist with the first scientific expedition to the Red River Valley wrote: “In some places pebbles were as abundant as if we had been travelling upon the bed of some former river or lake; the mind endeavours in vain to establish limits to the vast expanse of water which certainly at some former day overflowed the whole of that country.” Later explorers and geologists such as David Owen (1848) confirmed Keating’s view: “Pembina Mountain is, in fact, no mountain at all, nor yet a hill. It is a terrace of table-landthe ancient shore of a great body of water, that once filled the whole of the Red River Valley.” So striking were the remnants of this lake that in later years they drew comment from such noted explorers as John Palliser and Henry Hind. By the close of the nineteenth century it was generally accepted in scientific circles that the lake had formerly existed. The most common explanation for its origin was that it had formed from the meltwaters of a great glacier which had once overridden much of northern Canada. Although he had never visited the area and had not been directly involved in the research, the lake was named in honour of naturalist Louis Agassizthe most vocal advocate of glacial theory. At the height of the last Ice Age some 20,000 years ago, all of what is now Manitoba lay beneath a sheet of ice which in places was as much as four kilometers thick. Calculations indicate that it covered over 13,000,000 square kilometers and was composed of 25,000,000 cubic kilometers of ice. The massive weight of this ice sheet was sufficient to compress the earth’s crust by as much as one hundred meters. So much of the earth’s water was “locked-up” in the continental glaciers that ocean levels dropped dramatically, exposing coastal shelves which had previously been submerged. The shallow sea floor between Alaska and Siberia was also exposed, thus forming a 1,500-kilometer-wide land bridge between the Old and New Worlds. It is believed that it was by this route that people first entered the Americas. More is known about the last and most recent glacial advance than earlier ones because each partially “erased” the evidence of its predecessors. From its centre in Hudson Bay, the ice sheet advanced southwards, carrying soil and stones within it and planing the landscape ahead of it. This debris was deposited in long ridges called “terminal moraines” which mark the point of maximum advance. Unlike the glacial advance, the “retreat” was not characterized by a physical movement of the ice. Rather, with an improvement in climate, its southern edge began melting at a rate faster than “new” ice was being forced towards it. Nor was deglaciation a continuous event. Manitoba and the neighbouring provinces and states emerged from beneath the ice sheet in a series of advances and retreats. The ultimate extent of glacial Lake Agassiz. Although the lake was never this large at any one time, by the time that it had run its course this much territory had been covered by its waters. The southwestern corner of the province was the first to be exposed, and this event dates roughly to 11,500 years ago. In the few centuries which followed, Glacial Lakes Souris and Agassiz were formed from meltwater which ultimately drained southward into the Mississippi watershed. Lake Souris, most of which lay in North Dakota, was to be short-lived, but Lake Agassiz, initially restricted to what is now the Red River Valley of North Dakota, was fated to expand to the north with the retreat of the glacier. Between approximately 11,100 and 10,900 years ago, Lake Agassiz’s north and northeastern shores consisted of a continuous cliff of ice, but its eastern and western shores formed what geologists refer to as the “Campbell Beach.” This extensive sand and gravel ridge, most evident in south-western Manitoba, is possibly the most eloquent testimony to the existence of this once-great lake. 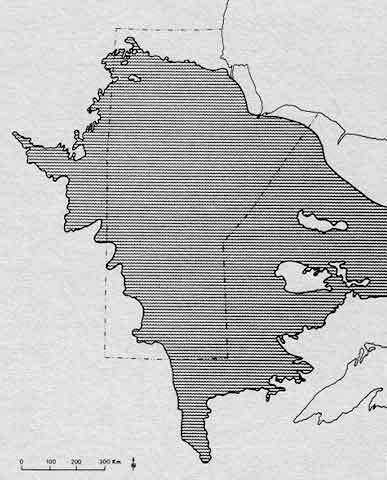 Shortly thereafter, a new outlet through the ice opened into the Lake Superior basin, thus allowing Agassiz to drain in that direction. A glacial readvance subsequently blocked this outlet and the lake rose to the Campbell Beach once again. This stage too was relatively short-lived; some 9500 years ago the eastern outlet re-opened and Agassiz drained rapidlyprobably with catastrophic results. As much as 3,000 cubic kilometers of water (seven times the volume of Lake Erie) coursed into the Superior Basin in just a few weeks. From this point, Lake Agassiz continued to drain to the north, creating a series of beaches which bear the name of local towns: McCauleyville, The Pas, Lower Pas and Gimli. The progressive discharge of the lake into Hudson Bay was hastened by a process known as “isostatic rebound.” With the removal of the mass of ice and water, that portion of the earth’s crust which had formerly been compressed was allowed to return to its pre-glacial elevation. This “rebounding” continues today; the southern shore of Lake Winnipeg is rising at a rate of about ten centimeters per century. The more rapid uplift immediately following deglaciation undoubtedly accelerated the northerly outflow of Lake Agassiz. By 7700 years ago only lakes Winnipeg, Winnipegosis and the other of Manitoba’s “Great Lakes” remained as vestiges of their glacial forerunner. At its maximum, Lake Agassiz was larger than any other glacial or modern lake in North America and was rivalled only by other prehistoric lakes in Asia and Africa. Its basin covers over one-half million square kilometers, although no more than 200,000 was inundated at any one time. Complementing its considerable extent was its depth; the present site of Winnipeg was at times below 213 meters of water. The sheer size of the lake and its associated environmental ramifications must have had a significant impact on Manitoba’s prehistoric residents. Evidence of the presence of Canada’s two earliest cultures, dating from 11,500 to 10,000 years ago, is extremely limited and restricted to the south-western corner of the province. These two cultures depended upon the mammoth and bison respectivelyboth grassland adapted species. As southwestern Manitoba was dominated by a coniferous forest at that time, the scarcity of these peoples’ artifacts is understandable. The fact that Lake Agassiz stood at the Campbell Beach for much of this period explains the location of these artifacts only at or above this elevation. Ten thousand years ago the climate changed abruptly and dramatically, and the spruce forests of southern Manitoba were replaced by grasslands. Into this new grazing area came the bison which were slowly being driven from their usual range to the south by the increasing frequency of drought conditions. Not surprisingly, several cultures that depended upon the bison for their subsistence made their first appearance in Manitoba at this time. There is only the slightest evidence to suggest that the lake or its shores supported the particular animal species or sufficient numbers of animals to constitute a favoured hunting territory for these early peoples. Certainly in its earliest stages Lake Agassiz was a cold sterile lake with unvegetated margins. Over time, however, plant cover developed and various forms of marine life which had survived glaciation managed to invade the lake by the various inlets and outlets which connected it with other water systems to the south and east. A few species of small molluscs and the bony plate of a sturgeon have been found in the beach deposits of Lake Agassiz. The former are of significance as they require fish as hosts during part of their period of growth. It is improbable, however, that either of these would have been attractive resources for big game hunting plains nomads. Muskox remains have been recovered from beach deposits in southwestern Manitoba. The presence of this tundra-adapted animal serves as some indication of the nature of the environment to the south of the glacier. Bison were present in south-western Manitoba at least 10,000 years ago and were being hunted in southeastern Manitoba more than 8,000 years ago. By the time these early cultures had run their course, the lake too had vanished. The beaches which it had created nonetheless remained prominent features of the Manitoba landscape and were something of a mixed blessing for Manitoba’s Native peoples over the next 7,000 years. As these raised ridges hindered the drainage of water to the lakes in the east, extensive bogs and sloughs formed behind them, thus making east-west travel difficult. At the same time, these well-drained beaches served as natural north-south migration corridors. Nineteenth century explorers such as Henry Hind noted that these “pitching tracks” were the main and only roads in the low-lying country of southern Manitoba. Having good drainage and being elevated above the surrounding terrain, the beaches served as lookout stations for Native hunters from which they might spot approaching game. As many of the ridges traverse rich ecological zones abundant in the resources of both the grasslands to the west and the lakes, streams and forests to the east, they provided strategic locations for the establishment of more permanent encampments as well as transient hunting camps. Complementing their intermediate location relative to major ecological zones was the local environmental diversity that the beaches offered. Surveys have shown that portions of beaches which are cut by rivers were exceptionally favoured locations for prehistoric campsites. These afforded a ready supply of clean water as well as an east-west riverine transportation route. Two types of stone, quartz and Swan River Chert, occur in these beach deposits, and these were popular materials for the manufacture of stone tools throughout prehistory. Nodules of these are particularly easy to find on the banks of rivers which transect such deposits. In addition to their contribution to the day-to-day life of prehistoric Manitobans, the beaches witnessed religious or ceremonial activities as well. The relative ease with which they may be excavated and their prominence on the landscape rendered the ridges suitable places for the burial of the dead and the construction of burial mounds. Manitoba’s only known “medicine wheel,” located near Alonsa, is situated in such a location. These circular, often spoked arrangements of stones served different functions for various groups of people, but are frequently associated with such ceremonial themes as spiritual cleansing or renewal, revitalization of the earth and its resources, and appeasement of supernatural forces and beings. Clearly, Glacial Lake Agassiz and the beaches it created have played a central role in the shaping of Manitoba’s topography and human history. Coincidentally, the beaches continue to have significance to transportation and habitation, providing as they do an almost inexhaustible supply of sands and gravels for the construction of buildings and highways within our province.